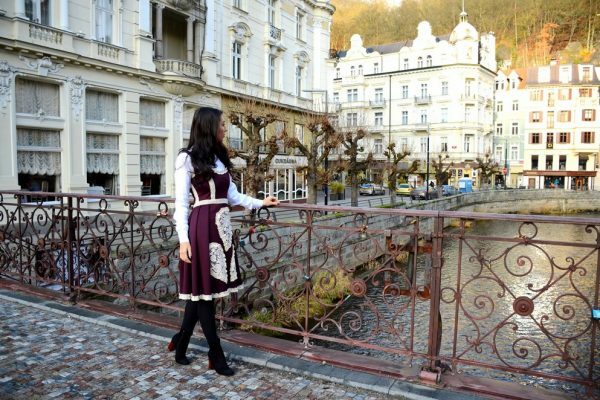 After the amazing day we’ve spent in Hallstatt and around, our next stop was in the beautiful Salzburg 🙂 We’ve done a lot research from home and we knew exactly what to visit in town, but long trips by car are simply exhausting, and we couldn’t wake up as early as we usually do to take photos. We arrived in town at around 12 pm and went straight to the first place on our list, but let’s face it, going at noon in a very popular place is always a bad idea, because it’s super crowded. 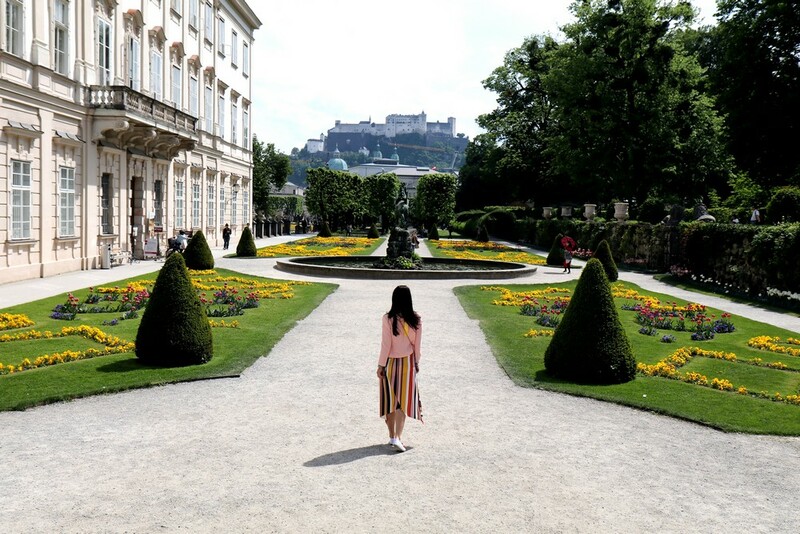 The first place on our list was the Mirabell Palace and its amazing gardens, a charming complex, which was built in the 17th century on the north river side of Salzach, from where you could also get an awesome view of the imposing Hohensalzburg Castle. It’s one of the most picture-perfect spots in town, but since it was very crowded we’ve had to wait hours to get at least a few decent shots. Luckily it was very warm outside and we had so many things to see, so we’ve walked around these beautiful gardens for a while and then we’ve searched for a Starbucks cafe nearby, because we’ve skipped the morning coffee to get here as fast as possible and really needed an energy boost. 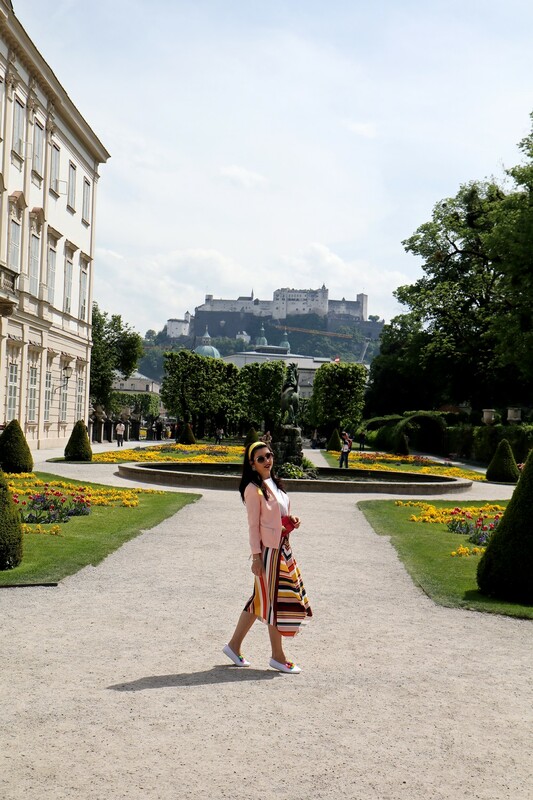 A half an hour break was perfect for us and I was so happy because I’ve had my sneakers with me, because we had to walk and climb many stairs to get the most amazing view of Salzburg. There’s an old monastery on top of a hill right next to the city center and even though it’s a bit hard to get there, it’s totally worth it, because the view is simply breathtaking. 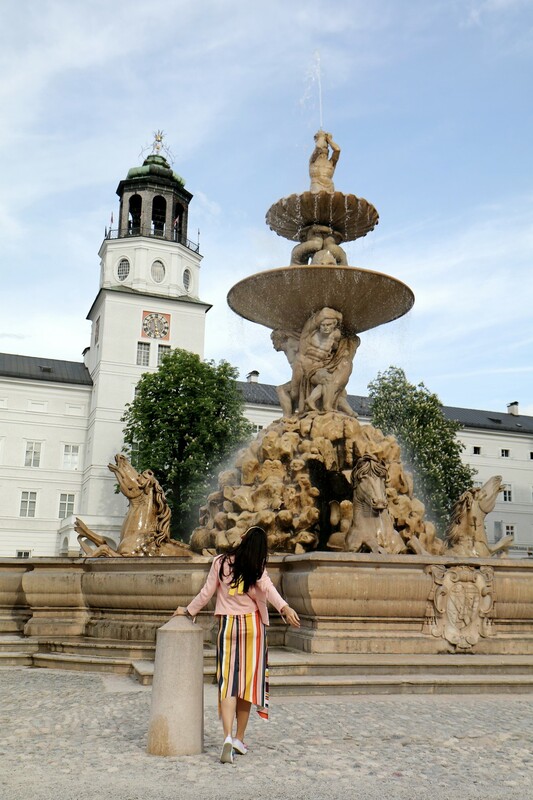 Another spot from where you could get awesome shots of the city and castle is a small pedestrian bridge going from the Mirabell Palace to the old city center, a bridge that’s also filled with thousands of love lockets. I don’t remember its exact name, but it’s very easy to find and I’m sure you will love it! Salzburg’s city center looks very interesting, even though part of it was under renovation. 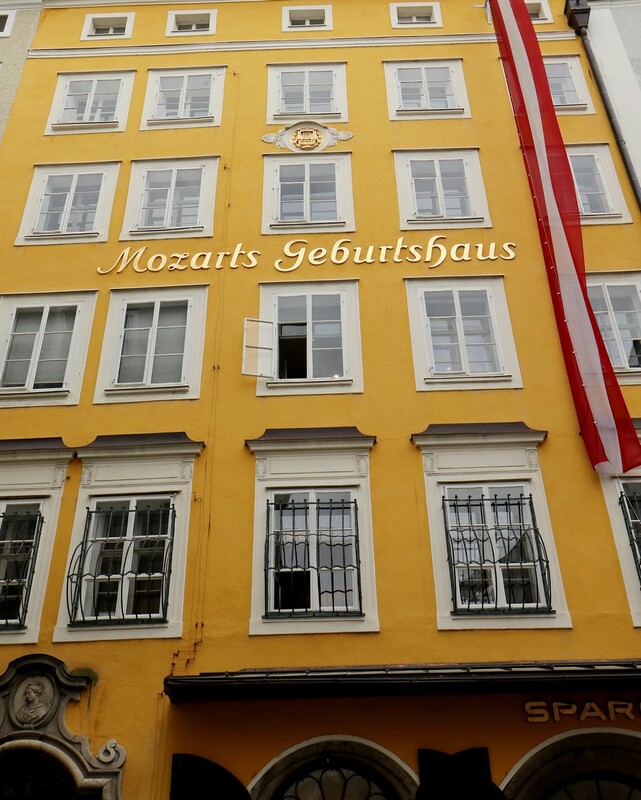 It’s not exactly my favorite, although I really liked the fact that you could see the house where the great Mozart was born and also another home where he lived for a while. It’s an amazing feeling to walk on the same streets as legends and you’ll have a great vibe after spending at least a few hours here.